The Baby Blooms Boy is a swirl of chiffon yellow, creamy ivory and mossy green. The ideal gift for new parents, this gorgeous boxed arrangement will please the whole family. 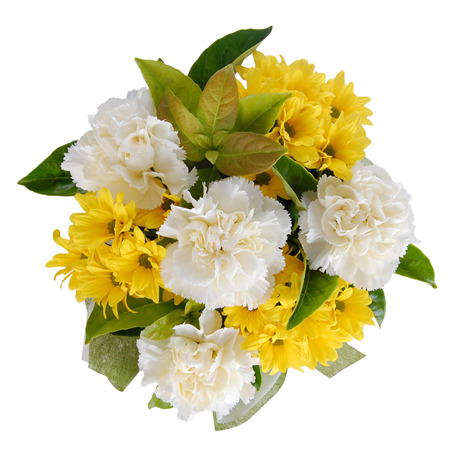 Convenient, cost effective and filled to bursting with the freshness of citrus yellow chrysanthemums and pearl white carnations, your lucky recipients will be thrilled with your thoughtfulness while tiny hands will love grasping onto their new teddy. Because we know new parents are often exhausted and don’t have time to arrange flowers in a vase, we’ve put together a selection of low-maintenance floral arrangements which require occasional watering. Celebrating the arrival of a new baby has never been easier.